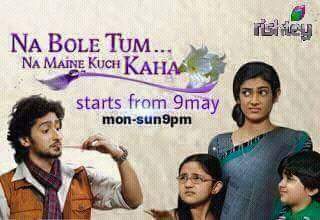 Na Bole Tum Na Maine Kuch Kaha Season 1 is an Indian soap opera which aired on the Hindi entertainment channel Colors TV from 9 January – 5 October, 2012. But now it will again telecast on Rishtey Hindi Channel. This show is directed by Seema Sharma & Sudhir Sharma. The story of the show is written by Venita Coelho & Sonal Ganatra. 'Na Bole Tum Na Maine Kuch Kaha' Season 1 show is produced by Sudhir Sharma under Sunshine Productions. It is an unusual love story of Megha and Mohan who start off by hating each other and discover love in their tumultuous relationship. Megha is a dutiful daughter-in-law and a single mother of two kids who goes out of her way for her family. Mohan is a self-centered bachelor who does not believe in the values that Megha stands for. Fate orchestrates their lives in such a way that they are perpetually pitted against each other. An interesting tale on the challenges faced by Megha and Mohan in discovering each other and finding love.